Now a third one of Darwin's great contributions was that he replaced theological, or supernatural, science with secular science. Laplace, of course, had already done this some 50 years earlier when he explained the whole world to Napoleon. After his explanation, Napoleon replied, "where is God in your theory?" And Laplace answered, "I don't need that hypothesis." Darwin's explanation that all things have a natural cause made the belief in a creatively superior mind quite unnecessary. He created a secular world, more so than anyone before him. Certainly many forces were verging in that same direction, but Darwin's work was the crashing arrival of this idea and from that point on, the secular viewpoint of the world became virtually universal. ERNST MAYR is Alexander Agassiz Professor of Zoology, Emeritus, at Harvard University. He is the recipient of numerous honorary degrees and awards, including the National Medal of Science, the Balzan Prize, and the Japan Prize. Mayr is one of the 20th century's leading evolutionary biologists. His work has contributed to the conceptual revolution that led to the synthesis of Mendelian genetics and Darwinian evolution, and to the development of the biological species concept. His theory of peripatric speciation has become widely accepted as one of the standard modes of speciation, and is the basis of the theory of punctuated equilibrium. Furthermore, his writings reflect, not only a technical expertise in biological subjects, but also a broad and penetrating understanding of the deeper philosophical issues involved. Among his many books are Animal Species and Evolution; Evolution and the Diversity of Life; Systematics and the Origin of Species; The Growth of Biological Thought; One Long Argument; Population, Species, and Evolution; This Is Biology; and Toward a New Philosophy of Biology. When the first bird survey of the Cyclops Mountains was carried out. I found it hard to imagine how anyone could have survived the difficulties of that first survey of 1928, considering the already-severe difficulties of my second survey in 1990. That 1928 survey was carried out by the then-23-year-old Ernst Mayr, who had just pulled off the remarkable achievement of completing his Ph.D. thesis in zoology while simultaneously completing his pre-clinical studies at medical school. Like Darwin, Ernst had been passionately devoted to outdoor natural history as a boy, and he had thereby come to the attention of Erwin Stresemann, a famous ornithologist at Berlin's Zoological Museum. In 1928 Stresemann, together with ornithologists at the American Museum of Natural History in New York and at Lord Rothschild's Museum near London, came up with a bold scheme to "clean up" the outstanding remaining ornithological mysteries of New Guinea, by tracking down all of the perplexing birds of paradise known only from specimens collected by natives and not yet traced to their home grounds by European collectors. Ernst, who had never been outside Europe, was the person selected for this daunting research program. Ernst's "clean-up" consisted of thorough bird surveys of New Guinea's five most important north coastal mountains, a task whose difficulties are impossible to conceive today in these days when bird explorers and their field assistants are at least not at acute risk of being ambushed by the natives. Ernst managed to befriend the local tribes, was officially but incorrectly reported to have been killed by them, survived severe attacks of malaria and dengue and dysentery and other tropical diseases plus a forced descent down a waterfall and a near-drowning in an overturned canoe, succeeded in reaching the summits of all five mountains, and amassed large collections of birds with many new species and subspecies. Despite the thoroughness of his collections, they proved to contain not a single one of the mysterious "missing" birds of paradise. That astonishing negative discovery provided Stresemann with the decisive clue to the mystery's solution: all of those missing birds were hybrids between known species of birds of paradise, hence their rarity. From New Guinea, Ernst went on to the Solomon Islands in the Southwest Pacific, where as a member of the Whitney South Sea Expedition he participated in bird surveys of several islands, including the notorious Malaita (even more dangerous in those days than was New Guinea). A telegram then invited him to come in 1930 to the American Museum of Natural History in New York to identify the tens of thousands of bird specimens collected by the Whitney Expedition on dozens of Pacific Islands. Just as Darwin's "explorations," sitting at home, of collections of barnacles were as important to Darwin in forming his insights as was his visit to the Galapagos Islands, so too Ernst Mayr's "explorations" of bird specimens in museums were as important as his fieldwork in New Guinea and the Solomons in forming his own insights into geographic variation and evolution. In 1953 Ernst moved from New York to Harvard University's Museum of Comparative Zoology, where even today he continues to work at the age of 97, still writing a new book every year or two. For scholars studying evolution and the history and philosophy of biology, Ernst's hundreds of technical articles and dozens of technical books have been for a long time the standard reference works. But in addition to gaining insights from his own fieldwork in the Pacific and from his own studies of museum bird specimens, Ernst has collaborated with many other scientists to extract insights from other species, ranging from flies and flowering plants to snails and people. One of those collaborations transformed my own life, just as the meeting with Erwin Stresemann transformed Ernst's life. While I was a teenaged schoolboy, my father, a physician studying human blood groups, collaborated with Ernst in the first study proving that human blood groups evolve subject to natural selection. I thereby met Ernst at dinner at my parents' house, was later instructed by him in the identification of Pacific island birds, began in 1964 the first of 19 ornithological expeditions of my own to New Guinea and the Solomons, and in 1971 began to collaborate with Ernst on a massive book about Solomon and Bismarck birds that we completed only this year, after 30 years of work. 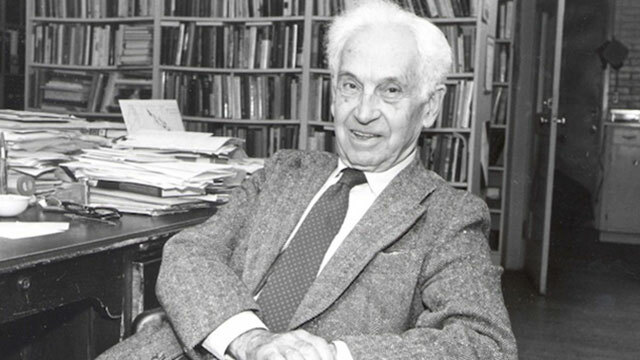 My career, like that of so many other scientists today, thus exemplifies how Ernst Mayr has shaped the lives of 20th-century scientists: through his ideas, his writings, his collaborations, his example, his lifelong warm friendships, and his encouragement. EDGE: To what extent has the study of evolutionary biology been the study of ideas about evolutionary biology? Is evolution the evolution of ideas, or is it a fact? ERNST MAYR: That's a very good question. Because of the historically entrenched resistance to the thought of evolution, documented by modern-day creationism, evolutionists have been forced into defending evolution and trying to prove that it is a fact and not a theory. Certainly the explanation of evolution and the search for its underlying ideas has been somewhat neglected, and my new book, the title of which is What Evolution Is, is precisely attempting to rectify that situation. It attempts to explain evolution. As I say in the first section of the book, I don't need to prove it again, evolution is so clearly a fact that you need to be committed to something like a belief in the supernatural if you are at all in disagreement with evolution. It is a fact and we don't need to prove it anymore. Nonetheless we must explain why it happened and how it happens. One of the surprising things that I discovered in my work on the philosophy of biology is that when it comes to the physical sciences, any new theory is based on a law, on a natural law. Yet as several leading philosophers have stated, and I agree with them, there are no laws in biology like those of physics. Biologists often use the word law, but for something to be a law, it has to have no exceptions. A law must be beyond space and time, and therefore it cannot be specific. Every general truth in biology though is specific. Biological "laws" are restricted to certain parts of the living world, or certain localized situations, and they are restricted in time. So we can say that their are no laws in biology, except in functional biology which, as I claim, is much closer to the physical sciences, than the historical science of evolution. EDGE: Let's call this Mayr's Law. MAYR: Well in that case, I've produced a number of them. Anyhow the question is, if scientific theories are based on laws and there aren't any laws in biology, well then how can you say you have theories, and how do you know that your theories are any good? That's a perfectly legitimate question. Of course our theories are based on something solid, which are concepts. If you go through the theories of evolutionary biology you find that they are all based on concepts such as natural selection, competition, the struggle for existence, female choice, male dominance, etc. There are hundreds of such concepts. In fact, ecology consists almost entirely of such basic concepts. Once again you can ask, how do you know they're true? The answer is that you can know this only provisionally by continuous testing and you have to go back to historical narratives and other non-physicalist methods to determine whether your concept and the consequences that arise from it can be confirmed. EDGE: Is biology a narrative based of our times and how we look at the world? MAYR: It depends entirely on when in the given age of the intellectual world you ask these questions. For instance when Darwin published The Origin of Species, the leading Cambridge University geologist was Sedgwick, and Sedgwick wrote a critique of Darwin's Origin that asked how Darwin could be so unscientific as to use chance in some of his arguments, when everyone knew that God controlled the world? Now who was more scientific, Darwin or Sedgwick? This was in 1860 and now, 140 years later, we recognize how much this critique was colored by the beliefs of that time. The choice of historical narratives is also very time-bound. Once you recognize this, you cease to question their usefulness. There are a number of such narratives that are as ordinary as proverbs and yet still work. EDGE: Darwin is bigger than ever. Why? MAYR: One of my themes is that Darwin changed the foundations of Western thought. He challenged certain ideas that had been accepted by everyone, and we now agree that he was right and his contemporaries were wrong. Let me just illuminate some of them. One such idea goes back to Plato who claimed that there were a limited number of classes of objects and each class of objects had a fixed definition. Any variation between entities in the same class was only accidental and the reality was an underlying realm of absolutes. EDGE: How does that pertain to Darwin? MAYR: Well Darwin showed that such essentialist typology was absolutely wrong. Darwin, though he didn't realize it at the time, invented the concept of biopopulation, which is the idea that the living organisms in any assemblage are populations in which every individual is uniquely different, which is the exact opposite of such a typological concept as racism. Darwin applied this populational idea quite consistently in the discovery of new adaptations though not when explaining the origin of new species. Another idea that Darwin refuted was that of teleology, which goes back to Aristotle. During Darwin's lifetime, the concept of teleology, or the use of ultimate purpose as a means of explaining natural phenomena, was prevalent. In his Critique of Pure Reason, Kant based his philosophy on Newton's laws. When he tried the same approach in a philosophy of living nature, he was totally unsuccessful. Newtonian laws didn't help him explain biological phenomena. So he invoked Aristotle's final cause in his Critique of Judgement. However, explaining evolution and biological phenomena with the idea of teleology was a total failure. To make a long story short, Darwin showed very clearly that you don't need Aristotle's teleology because natural selection applied to bio-populations of unique phenomena can explain all the puzzling phenomena for which previously the mysterious process of teleology had been invoked. The late philosopher, Willard Van Orman Quine, who was for many years probably America's most distinguished philosopher — you know him, he died last year — told me about a year before his death that as far as he was concerned, Darwin's greatest achievement was that he showed that Aristotle's idea of teleology, the so-called fourth cause, does not exist. EDGE: Is this an example of Occam's Razor? MAYR: It's that in part as well, but what's crucial is the fact that something that can be carefully analyzed, like natural selection, can give you answers without your having to invoke something you cannot analyze like a teleological force. So Darwin really had an amazing impact, not just on evolutionary theory, but on many aspects of everyday human thought. My firm belief is that each period in world history has a particular set of ideas that are the Zeitgeist of that period. And what causes this Zeitgeist? The answer usually is that there are a couple of important books that have been responsible for everybody's thinking. The number one book in this realm is, of course, the Bible. Then for many years, the answer might have been Karl Marx's Das Kapital. There was a short period when Freud was mentioned (though I don't think he's mentioned anymore by anyone besides the Freudians). The next one — and there is no doubt in my mind that Darwin's Origin of Species was the next one — not only secularized science, gave us the story of evolution, but also produced hosts of really basic theoretical concepts, like bio-populationism and, as I showed, the repudiation of teleology. No one before Darwin had introduced these ideas or had advanced them so forcefully. EDGE: Not even the scientific community outside of evolutionary biologists? MAYR: No. They weren't brought up with these ideas, though scientists like T. H. Huxley probably felt, as he said, "how stupid of me not to have thought of it." EDGE: How do you account for the fact that in this country, despite the effect of Darwinism on many people in the scientific community, more and more people are god fearing and believe in the 8 days of creation? MAYR: You know you cannot give a polite answer to that question. EDGE: In this venue we appreciate impolite, impolitical, answers. MAYR: They recently tested a group of schoolgirls? They asked where is Mexico? Do you know that most of the kids had no idea where Mexico is? I'm using this only to illustrate the fact that ­ and pardon me for saying so ­ the average American is amazingly ignorant about just about everything. If he was better informed, how could he reject evolution? If you don't accept evolution then most of the facts of biology just don't make sense. I can't explain how an entire nation can be so ignorant, but there it is. EDGE: I understand that there is a facsimile of the first (1899) edition of Darwin's Origin of the Species. MAYR: Yes and this is an interesting story. Darwin's importance has only been gradually acknowledged. Even 50 years ago, Darwin was just one of those people's names you learned was kind of important. That was it. Nobody read him. Well I published a very successful book for Harvard University Press in 1963 and this gave me the courage to go to the director of Harvard Press, Tom Wilson, and say to him, Tom, I have a great wish, a heart's desire, and that is to see a facsimile edition of the first edition of the Origin of Species. We have facsimile editions of all the great classics, but we haven't got one for Darwin. So he said all right, all right, we'll do it for you, even though we'll probably lose money since who's going to buy it? In 1964 they published this facsimile edition. That was almost 40 years ago. and at that time, the first few years I guess they sold about a couple hundred a year but much to everybody's surprise, sales did not drop off after all the libraries had their facsimile edition, but rather they picked up. After a while, they sold over a thousand a year, and then about 6­7 years ago I was informed by Harvard Press that for that particular year they had for the first time sold 2,500 copies. The last two years I have a report that they sold 3,000 copies a year! Now this shows you how an interest in Darwin has been steadily growing in spite of the great majority of ignorant people. People are beginning to want to know what Darwin really said, which for me is an absolutely marvelous development. You know there's an interesting side note that as a publisher you might be interested in. In the first edition of the Origin of the Species there's not a single misprint. What a document of the workmanship in 1859. EDGE: Where do the generation of William Hamilton, George Williams and John Maynard Smith fit in? MAYR: Hamilton never denied the primacy of the individual. In the case of G. C. Williams, I have come to the unhappy conclusion that not many of the proposals of his best known book, Adaptation and Natural Selection (1996) are valid. EDGE: All right, so Darwinism isn't going to change in 50 years, but the people writing about it certainly are changing. MAYR: Every year one if not two books come out about Darwinian theory. Many of them are favorable, which is fine, and yet as many others attempt to improve or revise Darwin's original ideas, coming up with some so-called new theory that is invariably total nonsense. EDGE: I can imagine what you think about evolutionary psychology. MAYR: Not necessarily! To tell the truth, I don't know much about it, but I have heard there's a field called evolutionary epistemology. They use a very simple Darwinian formula that can really be stated in a single sentence. If you have a lot of variation, more than you can cope with, only the most successful will remain. That is how things happen. In epistemology and countless other fields. Variation and elimination. EDGE: Who's notable in that field? MAYR: Quite a few people though I can't recall their names right now. Suffice it to say that there are many more evolutionary epistemologists in Germany and Austria than in this country. EDGE: It seems to me that Darwin is much better known in England than in the United States. Books about Darwin sell well and people debate the subjects. Here in America what passes for intellectual life doesn't necessarily include reading and having an appreciation of Darwin. MAYR: Yet the funny thing is if in England, you ask a man in the street who the greatest living Darwinian is, he will say Richard Dawkins. And indeed, Dawkins has done a marvelous job of popularizing Darwinism. But Dawkins' basic theory of the gene being the object of evolution is totally non-Darwinian. I would not call him the greatest Darwinian. Not even Maynard Smith. Maynard Smith was raised in math and physics, and he was an airplane engineer in the last war. For the most part, he still thinks like a mathematician and engineer. His most successful contribution to evolutionary biology has been applying so-called game theory to evolution. Personally I have — and now I perhaps expose myself to a great deal of criticism, but regardless — I have always been a little unhappy about that application of game theory. What animal ever, in a confrontation, would say, now let me figure it out, would it be better to be timid or would it be better to be bold? That's not the way organisms think. You get — and somebody would have to work this out since I'm not a mathematician — exactly the same result if you have a population with every animal acting with a different mixture of timidity and boldness. Individuals at one end of the curve are very timid and have little boldness, individuals in the middle of the curve have an appropriate mixture of timidity and boldness, and individuals at the other end of the curve are very bold. Somewhere in between, in a given environment with a given set of enemies and competitors, is the best mixture of the two tendencies. You get the same results with game theory, but in my opinion, the better solution has a much more biological, Darwinian approach. EDGE: How can the evolution of human ethics be reconciled with Darwinism? Doesn't natural selection always favor selfishness? MAYR: If the individual were the only target of selection, this would indeed be an inevitable conclusion. However, small social groups that compete with each other, such as the groups of hunter-gatherers in our human ancestry, were ­ as groups ­ also targets of selection. Groups, the members of which actively cooperated with each other and showed much reciprocal helpfulness, had a higher chance for survival than groups that did not benefit from such cooperation and altruism. Any genetic tendency for altruism would therefore be selected in a species consisting of social groups. In a social group, altruism may add the to fitness. The founders of religions and philosophies erected their ethical system on this basis. EDGE: A number of years ago I was talking to a German publisher about a new book on Darwinism. "I can't publish it," he said. "It's just too hot to handle." Why is Darwin so dangerous, to use Dan Dennett's phrase? MAYR: I have a good deal of contact with some very good young German evolutionary biologists, and I'm constantly amazed how preoccupied they are with political concerns. It's just that they have gone through a series of political changes, from the Weimar Republic, to the Nazi period, Soviet occupation, DDR, and finally a United Germany, and throughout this time, everything has always been colored by politics. People got their jobs because they were Nazis, or because they were anti-Nazis, and so forth. They have to find a way to purge this from their system. In Germany, they scrutinize all leaders in a field and check all the records as to whether they had been Nazis, which Nazi organizations they might have belonged to, whether they published either papers or books that indicate that they had been Nazis or Communist, etc. They think they have to do all this cleansing of science so that people can't go and say well you didn't tell us that so-and-so was a Nazi or a Communist. Scientists just have to cope with that. On the other hand, translations of my books that were published in Germany have been very successful. In fact, one of them is so successful that the German printing has run out and I can't persuade the publisher to republish it. He asks why he should publish another German edition of the book, when everybody reads the English edition. Which is true. EDGE: Recently the Frankfurter Allgemeine Zeitung began an initiative in their Feuilletton (Arts and Culture) section to present popular science and big scientific ideas to the public. MAYR: I would say that generally you have far more food for the intellect in foreign newspapers than you have in American ones, except a little bit in papers like the Washington Post or The New York Times. It's remarkable; you pick up a German newspaper and there's all sorts of good reading material in it. Whereas we have very few such general interest articles in our papers. The focus in our papers tends to be almost exclusively on news rather than on education.